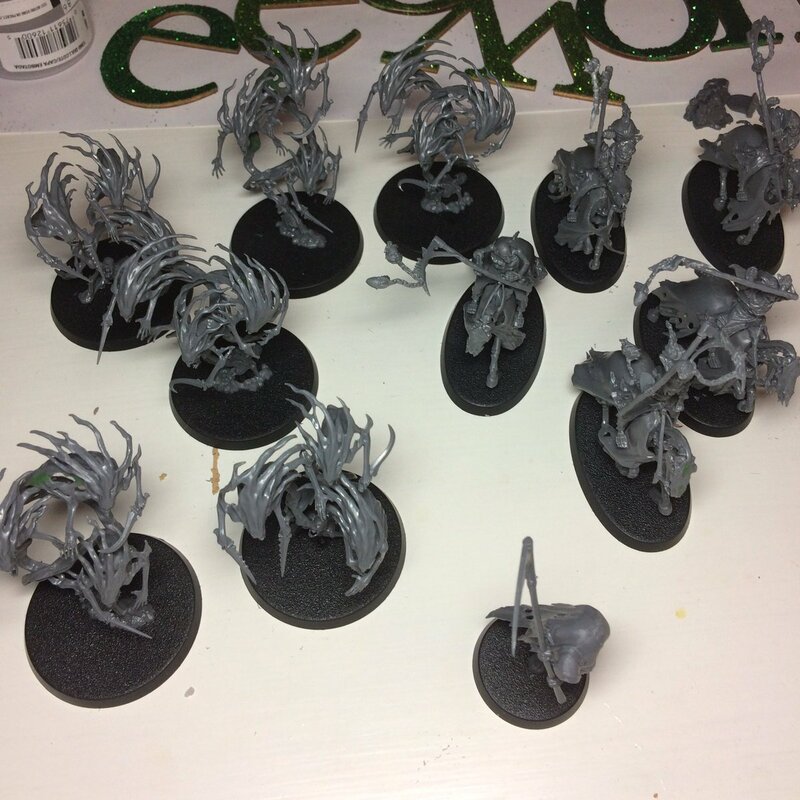 Today I have my first 1,000 point army built solely for Age of Sigmar! 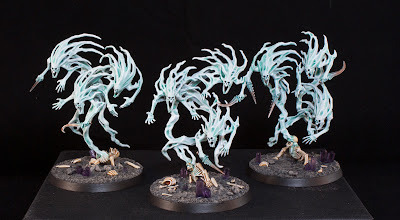 I picked the Nighthaunts in the fall and finished them over the course of about a month and a half, and what a fun army they were to paint. When I bought my ticket for Adepticon this year I decided to sign up for the AoS team tournament as well as the regular tournament to really pack in the gaming. Originally I was just going to take 1,000 points of my Tomb Kings for my half of the team tournament, but after a bit of thinking I decided this was the perfect opportunity to start a new army! I had a few ideas for what faction I was going to pick and even did a few different test models including an Ironjaw, a Skaven, and a Cairn Wraith. 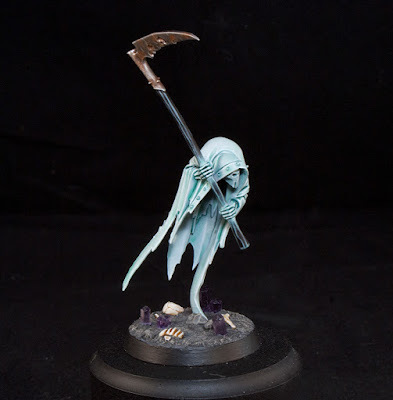 I really like the Death grand alliance and the speed and simplicity with which I finished the Wraith sealed the deal for me. At the time a pure Nighthaunt army was also extremely rare to see, though now they are everywhere. I sat down to write a list before I bought anything. 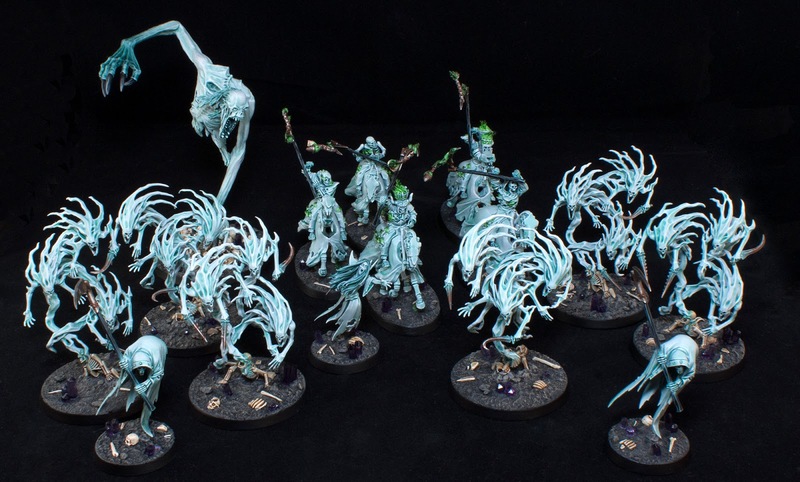 With a lot of my armies I just buy what I think is cool and paint and grow the army as I go along. Since I had a hard goal of getting a 1,000 point playable army done though, I decided it was best to know exactly what I was going to do from the start. 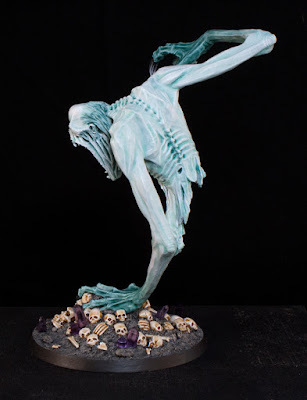 It was small, with only 15 models total, but also packed a punch with the dreaded Mourngul. It also had three heroes which is vital for the Three Places of Power scenario. For the Team event this is only half of the army too, with my friend filling in the blanks of what my army is missing. I wanted to make sure this worked well on its own too since I plan on playing 1,000 point games with them outside of the Tournament and also expanding the army up to 2,000 points eventually. I ordered everything and got it all at once except for the Banshee and Mourngul which came a little later. I built everything I had and primed it all together to save time. Even though this was a "quick" army I still made sure to clean all of the mold lines and fill any obvious gaps. They were all primed white, which I did in a few thin coats to make sure I didn't clog up any details. With the priming done so was my base coat. I used the Corax White spray from GW, which is actually a slightly off white. There were same areas that weren't fully covered by the primer and you could still see a bit of the grey plastic showing through, but these areas all fell where it logically made sense to have a shadow. Plus, it would be blended in during later stages, so I left them as they were unless it was really bad. Where I did have to touch up a few areas I used Ulthuan Grey because it's actually closer in color to Corax White than any of the GW White paints. 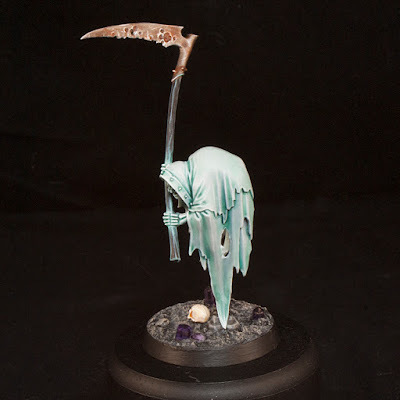 You can read a detailed step by step painting tutorial for the Cairn Wraith which was my test model here. 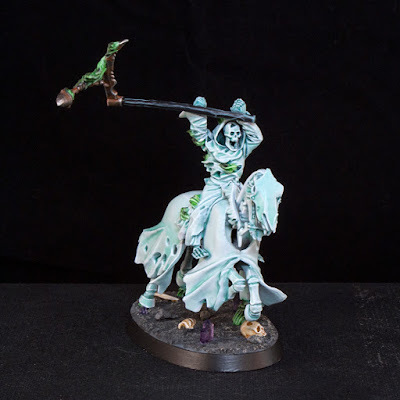 This goes over all of the basics that I utilized on every single model in this army. There are a few things I had to do differently on a few of the models though. 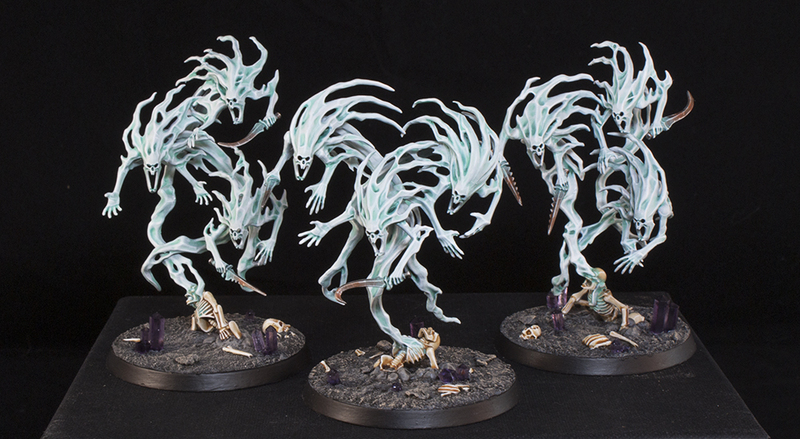 The first thing I decided to paint were the six bases of Spirit Hosts to get the battleline units for the army done. I painted them just like the Wraith, but used some watered down white to more fully blend the tendrils coming off of their heads. This just lightens up the face a bit more. 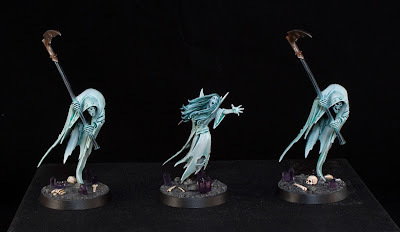 Their knives were a bit trickier than the scythe hafts to do the ghostly blending effect, but after a little trial and error I got it to work and look good. 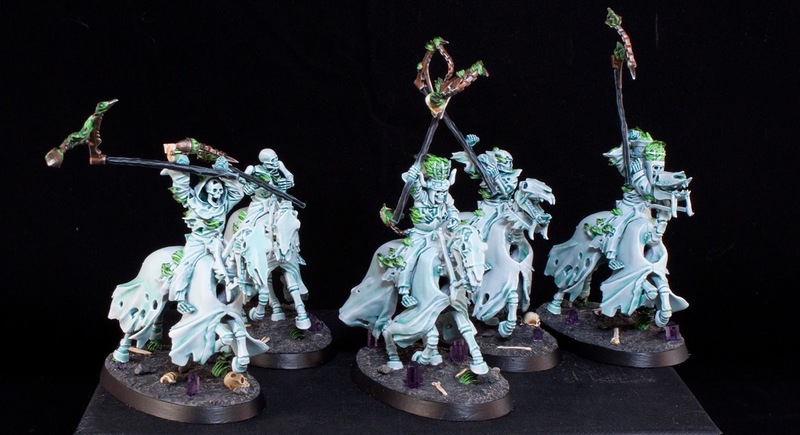 They also have the skeletons coming out of their bases which the spirits are emerging from. 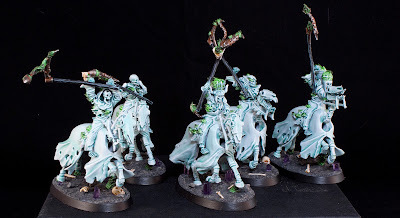 I touched these up with Ulthuan Grey, then shaded them all with undiluted Seraphim Sepia. This shaded the recesses of the skeletons and also "dyed" them a bone color. They were then simply line highlighted with white to finish them off. I used a bit of the Oxide color from the ghosts on the skeletons where the spirits came out of them to make it look like they were glowing. 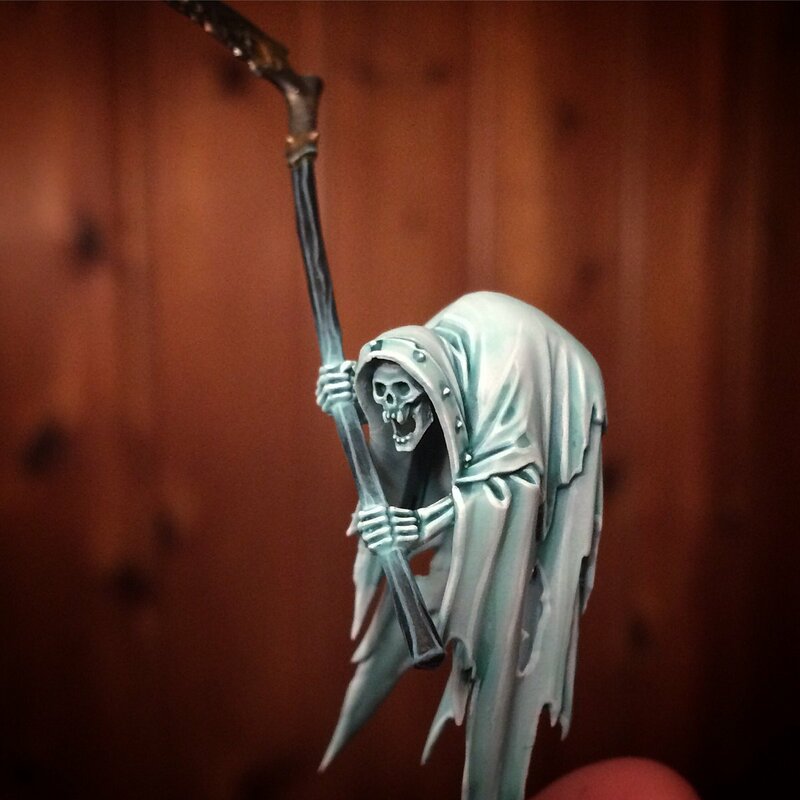 The Hexwraiths probably took the longest to paint. They were done more or less the same way as the rest of the army, but required me to be a lot more careful since there are so many large flat areas on them. I did have to go back with a mix of Ulthuan Grey and Nihilakh Oxide to smooth out a few areas on their horses' cloth. The flames were all shaded with Coelia Greenshade, then given two glazes of Waywatcher Green. 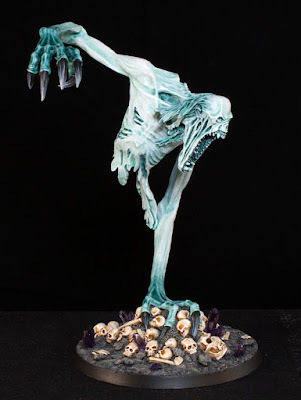 After this the ends of them were painted with Nuln Oil and the insides of the flames closest to where they originated were painted with watered down white. This makes it look like the flames are getting smokey near the ends and are brighter in the center like they would be in real life. 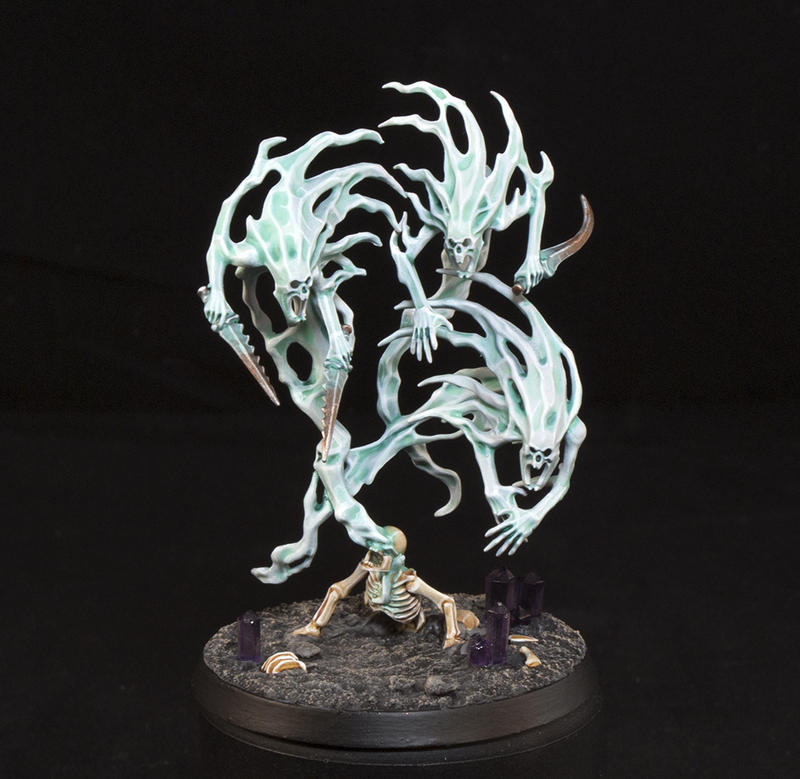 I also decided to paint all of the chains on them as real chains and just did a similar ghostly blend on them like I did on the weapons. 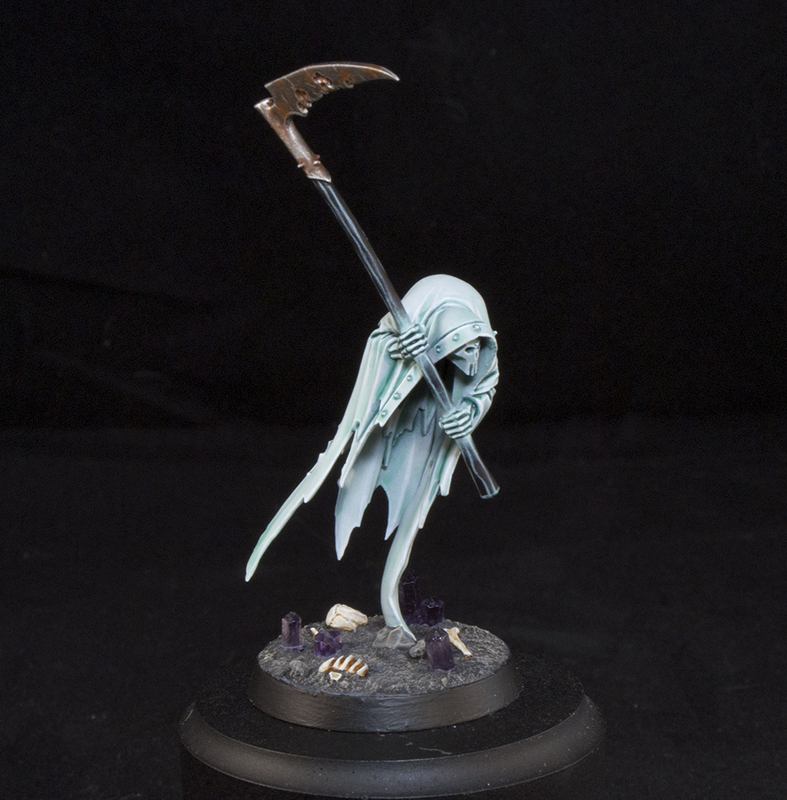 While I was working on assembling the Mourngul I painted the second Cairn Wraith in exactly the same manner as the first. These characters probably only take me about two hours to paint total, and some of that is drying time. The Mourngul had a bit of gap filling to do, but went together pretty easily. I really disliked the horse he's crushing in the original model, so I hacked it off. I didn't want to risk damaging the hand on the horses head, so I left the head in there, cut off as much as I could, and cut the bottom of it flat. I then glued him to the base and used Milliput to build up a mound around the horse head. Using about three different companies' skull packs I piled up a bunch of skulls around the Milliput to make it fit in with my bases. The majority of the Mourngul was painted in the same way as the rest of the models. I decided to make his hair darker though so this got an all over wash of Coelia Greenshade. I also wanted to make the hands darker, but with a gradient. To do this I used a mix of Coelia Greenshade and Lahmian Medium and did several layers, focusing more and more on the hands so that it gradually fades into the lighter color the higher up the arm you go. 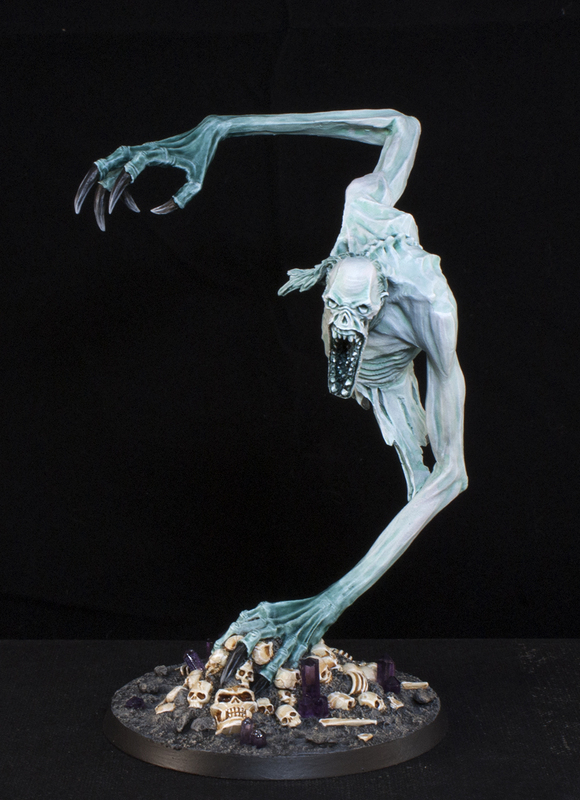 The claws were painted Black and highlighted with Dawnstone followed by Administratum Grey. The last thing I painted for the army was the Banshee. It was fairly simple to paint and only took about two hours total. 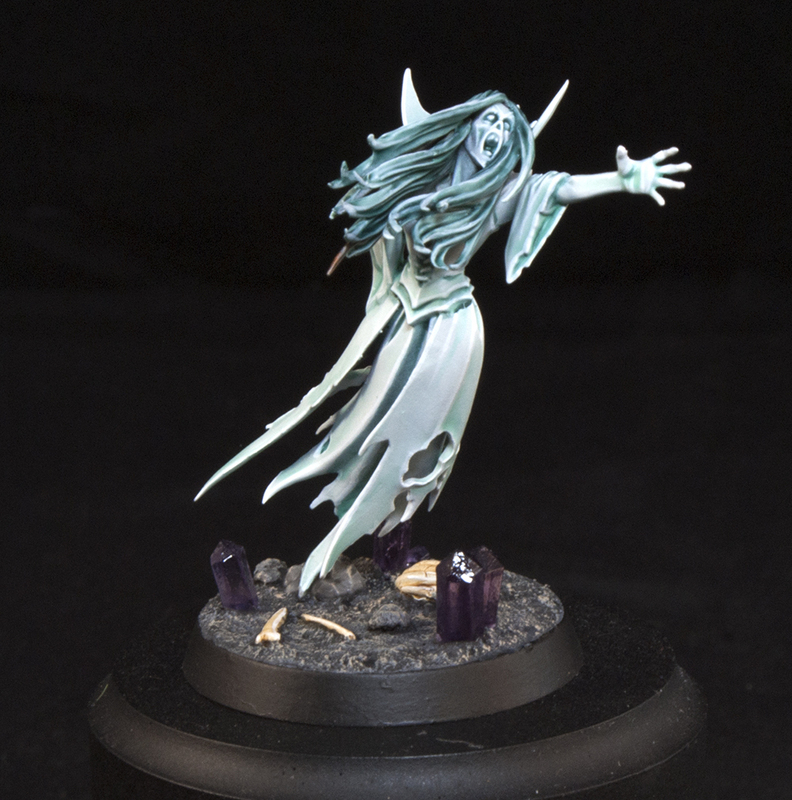 The only thing that was different on her from the Wraiths was to darken her hair with Coelia Greenshade and then re-highlight it a bit with Ulthuan Grey. The bases were honestly harder to do and took more time then the models themselves a lot of the time. The skeleton bits were mostly from Toad King Castings with a few skulls added in from Secret Weapon Miniatures. I really wanted it to look like my army was in a field of bones. The crystals are from Revivified Games, and in my opinion, are the frosting on the cake. I really had no idea what to do for the bases on this army at first. I wanted to use the Shattered Dominion bases, but they don't make the base size that the Spirit Hosts use. 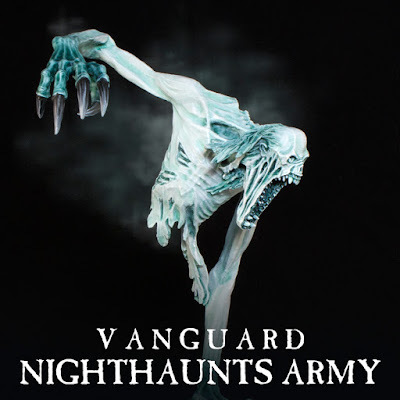 After mulling over several ideas I happened to re-listen to the Hunt for Nagash series by Josh Reynolds. In The Lords of Helstone there is a field of amethyst crystals described which are supposed to be pure concentrations of Death magic. I immediately knew this is what I wanted to do. After searching online for a bit I found the ones I wanted. I glue these on before I do any of the ground work, which was made with the Astrogranite texture paint. 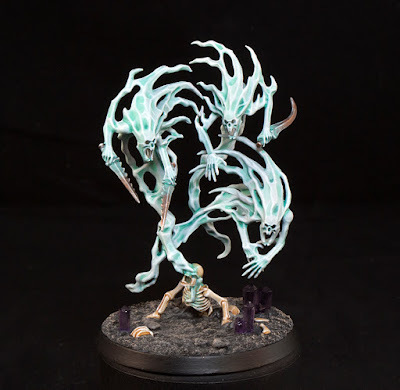 I had to be super careful around the crystals, bones, and Nighthaunts themselves when I was painting this on to avoid getting grey paint on them. This was then shaded with Nuln Oil and dry brushed with Dawnstone and Karak Stone. To finish it off the crystals were given a coat of Gloss Varnish to really make them shine. I'm super happy with how the army turned out and it went fairly quickly. I went on a two week vacation in the middle of it (when I went to Warhammer World), but even considering that it only took me about a month and a half to build and paint to completion. I really want to expand it out to 2,000 points and I'm currently playing around with some different lists. At the moment though I am happy with my Vanguard sized army and plan to play a few games with them soon, and of course take them to Adepticon in March for the Team Tournament. Next up I plan to build a display board for them which I think will end up looking up pretty cool, if I do say so myself. You can watch a video of the army with a couple of 360º views of the different units below.